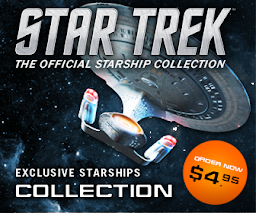 So we come to the 100th issue of the Starships Collection. A point many expected but one few have space to display. 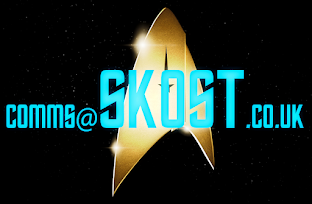 By mere coincidence this is the 600th Some Kind of Star Trek post!!! Fittingly this centennial edition, just as the 50th did, takes us right back to the show's origins and perhaps even more so than NCC-1701. Back in the day, Matt Jeffries designed the USS Enterprise but what first spewed forth onto the page wasn't the familiar shape we know today from The Original Series but this, what is now known as the Daedalus Class. Jeffries original sketches suggested a more cylindrical secondary hull and a spherical primary hull to get away from the cliched 'flying saucer' however we know how that turned out! What we have with issue 100 is an amalgamation - a fusion of Jefferies design, the enhancements Mike Okuda made for the colour and black and white editions of the Star Trek Chronology and updates included for this collection. Let's get down to it. You know this is one of those essential models. One that you have to have because of its place in franchise history and it will entice discussion since it's the first ship that hasn't really appeared on screen aside from a model in Sisko's office. 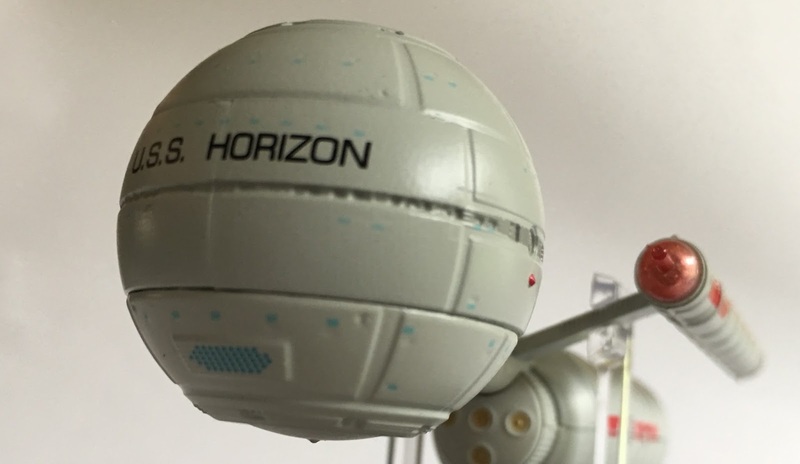 Labelled up as the USS Horizon, the ship firmly placed its links to The Original Series and specifically A Piece of the Action in which this craft was mentioned. At the front the spherical primary hull sits bold and proud emblazoned with the ships name - but it actually seems to be lacking in any finer detail. There's the grey colour scheme all over but when it comes to windows and definition that can be clearly seen on the magazine it's oddly devoid of such precision. 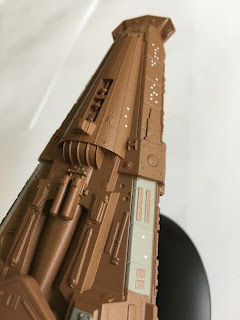 The mould is a good quality finish with the metallic ball joining to the secondary hull through the spindly, horizontal neck section which seems better finished than the 'head'. Horribly - and most evident in the headline picture are the window alignments on the hull - they're a mile out and honestly, the deflector looks a bit cheap. Comparing it to the plan views it should be a more subtle colour shade of grey rather than an emblazoned blue. Given that this is an interpretation of a classic design/sketch I'm going to go a little easy on this one but in some ways it does feel uncomfortably unfinished. The panel lines fee washed out and faint, almost over-simplistic which provides a very severe opposite to the back end. Moving back to the cylindrical secondary hull the detailing does increase noticeably. Panel lines are more clearly etched in and form is given much more shape and finery. While you could probably push to say that the primary hull has nice impulse engines and no bad join lines, the rear section feels like a ship and looks like a ship. It's complete, worked and feels like they didn't give up halfway through. For example there is much more structure to the additional airlocks on either side and fortunately the registry decals are perfectly aligned unlike we saw on the early prototype. Oddly the back end looks like a crisp metal finish while the sphere feels like a half-assed plastic blob. 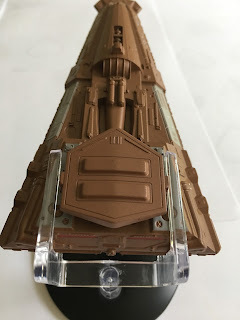 What is really nice about the secondary hull is the way in which the rear is properly finished with ship registry and, significantly, a shuttle bay and navigation lights. It makes the Horizon a complete 'thing' from every angle and makes her functional. 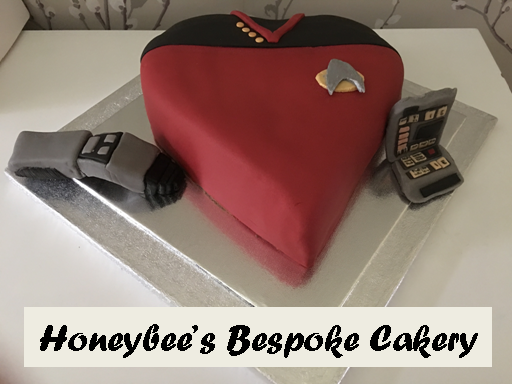 Now head out sideways from the barrel-shaped hull to the parallel warp nacelles. As with the secondary hull there is much more definition and the lines provide something of a primitive and industrial visualisation to the class. 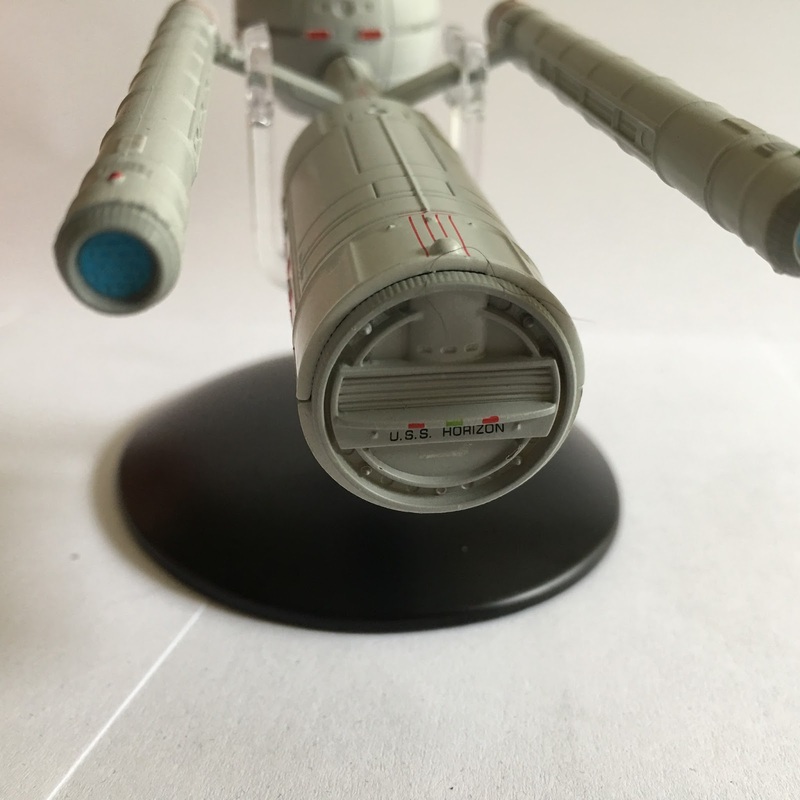 The rear exhausts are open as opposed to the grilles or 'balls' of the later Constitution Class and once more evoke a more basic sense of space exploration in the 22nd Century. The great thing with the Horizon (second ship in the collection with that name ladies and gents), is the percentage of metal over plastic. The whole of the sphere plus the neck, pylons and top half of the secondary hull is all metal. Yes, honestly, that's a lot of metal and a half. Only the lower half of the barrel-shaped engineering section plus the nacelles and the shuttlebay doors are plastic. Given the way that production has come on, the difference in surface quality is pretty good and at one point I couldn't tell if the whole of the secondary hull was metal or not. What does seem over basic are the bussard collectors. 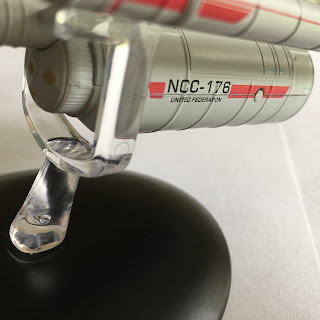 The finish on the Mirror ISS Enterprise engines had smaller spikes to the front but here they are moulded into the caps and seem ridiculously out of place. Definitely oversized for the ship and certainly lacking in the subtlety that we saw on the ISS Enterprise. Stand fitting is straightforward slipping right over the warp pylons and holding the USS Horizon firmly in place. No movement today people and she's nice and level for display. The magazine does offer some general background to the fictional class of starship including their introduction to the fleet as well as the influence of at least three of the class - Horizon, Essex and Archon on the galaxy and therefore a few episodes of the Star Trek franchise. Nicely though this issue does spread its coverage of The Return of the Archons, A Piece of the Action and The Next Generation's Power Play throughout rather than having a heavy focus on just one of the stories. The views of the ship are lovely and crisp although we still, one hundred issues in, still point out just the minimal basics. Have to admit that the renderings here are really good so at least they're not over labelled!!! The Designing the Daedalus Class section misses a trick I think, choosing to focus more on the redesigning of the ship for the Chronology and this publication. Of course that's not something that will have been extensively documented but the omission of the original Matt Jefferies sketches in a piece about something he was ultimately responsible for envisioning is glaring. 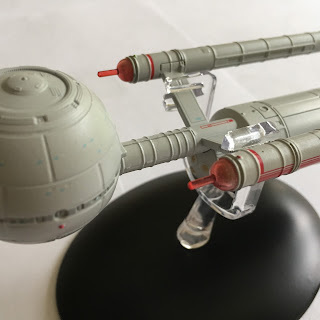 Yet this still remains a good read as you get more of a grip on what was altered and how the class came to look as it does now in the Starships Collection. Particularly nice to understand how some of the smaller detail was incorporated such as the navigational deflector and impulse engines which weren't considered back in those original drawings. As the collection has now surpassed another milestone the articles in the magazine are spreading the wings too with this issue covering The Star Trek History of Space Exploration. 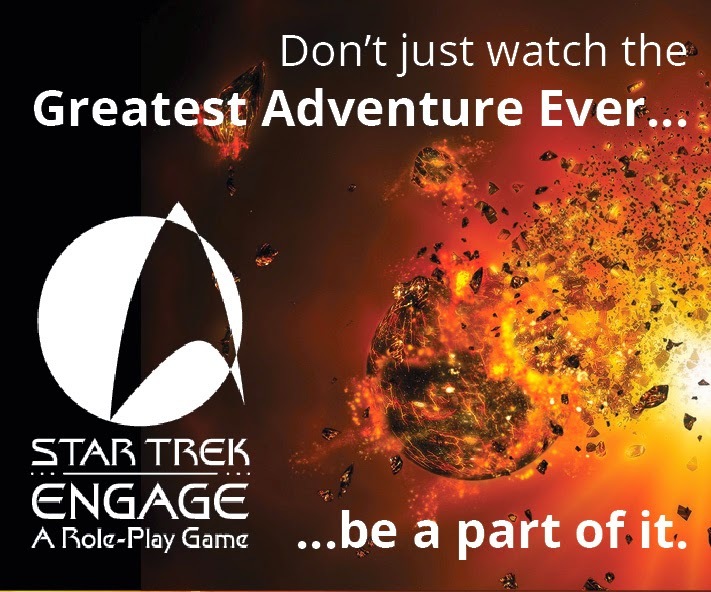 A fairly daunting title since that's effectively what the show - and the franchise - are about but Eaglemoss have managed to condense this down to exploration prior to Enterprise. 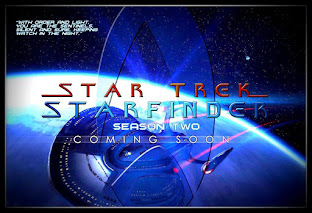 This does allow the article to delve into First Contact and the Vulcans, the Botany Bay and Khan as well as diverting into other elements seen in the series such as the NASA ship from The Royale and early explorers such as the Ares IV from One Small Step in Voyager and the Mariposa DY-500 Class craft from The Next Generation's Up the Long Ladder. When you get into this piece you realise just how much the show managed to cover! Issue 101 was a bloody good surprise. I genuinely lined myself up to give this one a bashing as I expected it to be just as 'brilliant' as the other Bajoran ships of which we have had three to daye including the magically unstable and home-movers nightmare, the Bajoran Solar Sailer. I mean, you can package this one till hell freezes and it'll still break. The Bajoran Antares Class freighter is a right chunky wedge of a starship and possibly the best offering from the nasally ridged humanoids. A ship of this shape may not immediately seem like the biggest draw but there's a good deal going for it here. The solid brown tone on the hull help to back the aged craft and make it feel fairly rustic. It is a very basic paint scheme with only a few sporadic grey panels to relieve the single shade. Right across the surface there are a considerable number of windows/portholes clearly visible although there does seem to be a discrepancy between the number on the ship and the number of the CG model in the magazine. What helps to set it apart is the external detail bolted onto the freighter's skin. There is trunking, machinery and general macguffins to help build up the detail and enhance the overall look of the craft. It might in essence be a single hulled slab but the finishing intricacies help pull it towards being something more interesting. 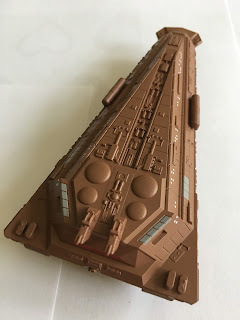 The upper half of the ship is a chunk of metalwork with the exception of the dorsal sensor array while the underside is a single piece of plastic. This is a really solidly constructed craft and there is a bit of weight behind it too because of that huge metal topside. The joins between metal and plastic are pretty smooth and the hull detail seems to be aligned pretty perfectly. 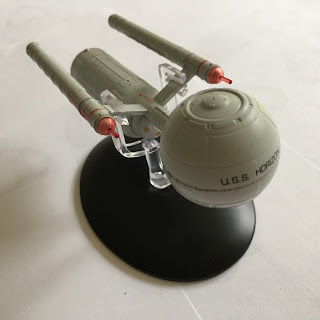 It's not the most glamourous of ships by a long shot but Eaglemoss have managed to construct something decent from a very average model and one I'm oddly impressed with. The outer layers here make this ship something interesting because of the undulation and the surface intricacies both top and bottom. The machining for this one is fantastic and there's no mould bleed or fade from one raised element into the main hull of the ship. 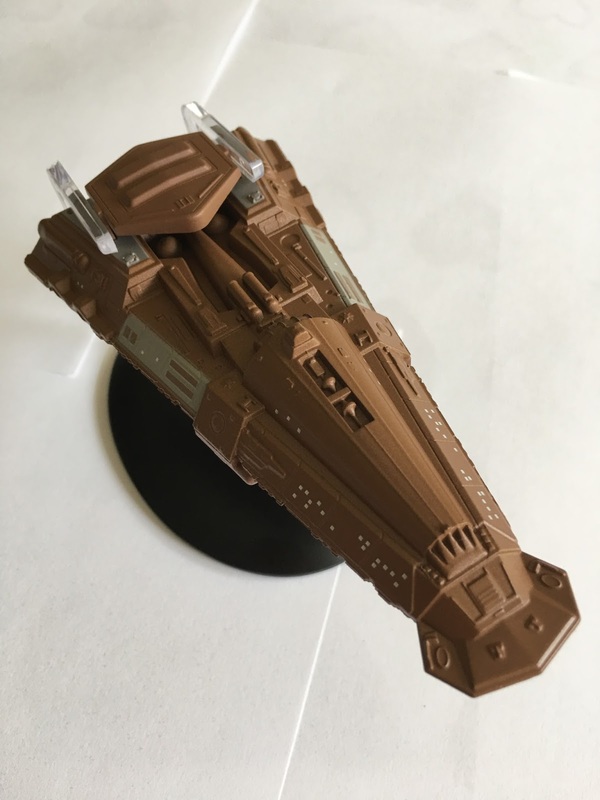 It feels like there's substance to this one and imagine if there had been a little more of the effort displayed here on the rather super-bland Federation Holoship then that release might have been a completely different story. On the underside as well the model retains this superb attention to detail continuing the layered hull effect and multiple windows to give strength to the depth of the design. The differentiation in surface height provides a certain realistic impression to the cumbersome freighter. Perhaps my only negative observation is that the nose 'fan' does appear slightly washed over with its finishing detail more smoothly edged than the rest of the ship. Actually the underside (in plastic) is far more detailed than the top with a few outward protrusions at the mid-point and also to the back. At the rear where the two different materials meet there's no evident difference in the quality around the engines nor as your eye follows the hull around the horizontal join. 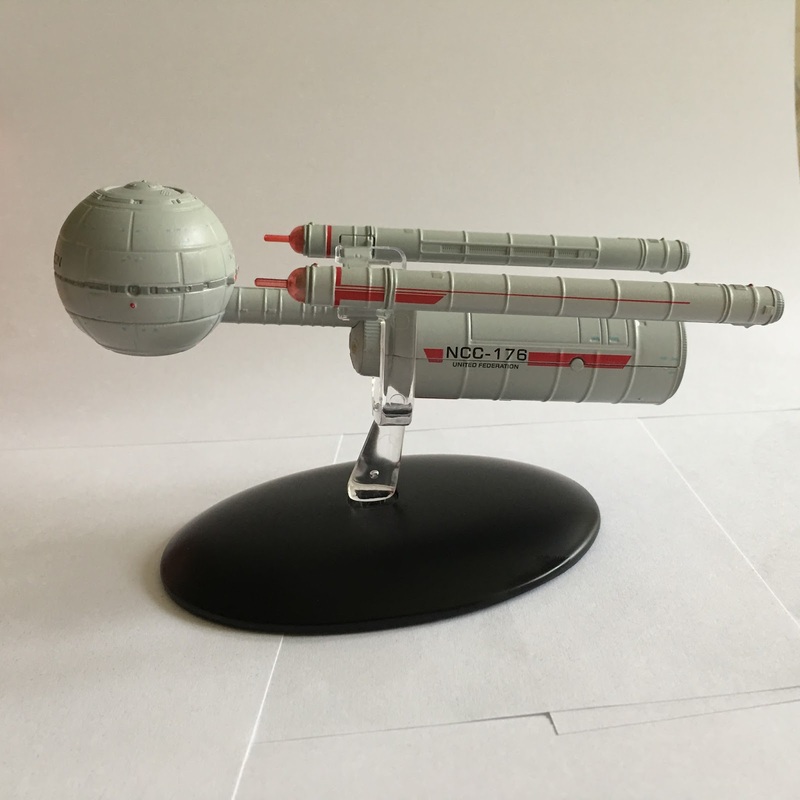 It is a very clean, well finished ship with almost no variant quality. Ok, there are a few details missing such as on the support struts to the sensor array and in some of the fin-work just behind the polaron beam weapon yet it still is a great model. To the all important stand fit and the wide-angle clip slides easily over the rear of the freighter. No movement, easy grip and a stable model all round. Just keep in mind that it is heavier than some others so I'll be keeping an eye on how the stand copes in the next few months. The issue 102 magazine recounts the freighter's appearances and uses within Deep Space Nine's corner of the Alpha Quadrant and then turns itself onto the history of it just this ship but the model itself. Fascinatingly this is one of the franchise's most reused models appearing as eight craft from the third season of The Next Generation right though to the third year of Enterprise. In fact we will be seeing another of its incarnations - the Smugglers' Ship from Unification - in an upcoming issue. Nice plan views from all angles included with this one which means you can pick out all the errors at close range. Note for one that there are some panels in a lighter brown colour and that the greys have a hint of blue to them. The views do highlight some of the slighter details around the edge of the hull and the dorsal sensor array. I mean there is a lot fitted in already but there are one or two glaring omissions which have to be down to overloading the model. This magazine also includes six pages on the creation of Deep Space Nine. It's not providing much, if any, new info because there have been a ton of books and previous works on the subject but as an overview this is more than fitting. In fact most of the section deals with the inclusion of Ro before being morphed into Major Kira once Michelle Forbes ruled herself out of the production. 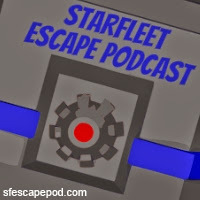 OK, to the next two issues and we'll be discussing the Klingon D5 from Enterprise and the Vidiian Warship from the first couple of seasons of Voyager. Pleased with issue 100? Impressed by the Bajoran Freighter?